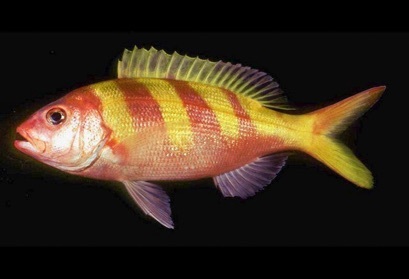 Estimation of fish age can be a tricky endeavor and a number of methods have been applied to the bottomfishes of Hawaii and other locations of the Insular Pacific. We are currently investigating age estimation of several bottomfishes, including onaga (Etelis coruscans) and gindai (Pristipomoides zonatus). An example of how much effort that may be required is with a recent study of opakapaka (Pristipomoides filamentosus) that involved the use of old and new data to answer questions about the age and growth of this species. Age estimation for opakapaka has been an ongoing problem because otoliths (fish ear stones) lack well developed annual growth zones. Otoliths of other fishes throughout the world have been shown to accurately store age information as annual growth zones and some are well defined (Figure 1). Figure 1. An example of an otolith (fish ear bone) cross-section from a fish with well-defined growth zones. This section is from a spotted sand bass (Paralabrax maculatofasciatus) in the Gulf of California. Notice the strong seasonal (annual) growth zone patterns visible in this section. This fish was 11 years old and was validated with edge-type analysis (Andrews et al. 2005). The growth zone structure of opakapaka otoliths provide hints at possible ways to estimate age, but the interpretation of growth zone counting procedures can be questionable (Figure 2). In addition, it is important to note that otolith section quality can vary considerably due to 1) differences in otolith formation between individuals, and 2) otolith section preparation procedures and the experience of the technician. Otolith sectioning and age-reading is a very specialized technique that cannot be readily implemented without properly trained personnel and considerable experience (e.g. Committee of Age Reading Experts, CARE). Figure 2. Otolith cross-section from opakapaka of Hawaii. Notice the highly variable growth zone structure with a few regions that show regular growth zone patterns. This fish was validated to 22 years old using a technique called bomb radiocarbon dating, discussed later and in Andrews et al. (2012), but consistent quantification of 22 annual growth marks was unsuccessful for this otolith section. Hence, it is possible that this species does not deposit growth zones that can be readily quantified and other methods need to be investigated for routine age estimation. Age estimation for the largest opakapaka has been an ongoing problem for the development of reliable growth parameters (how a fish grows in length over time). As a result of the wide range of age and growth studies, there are numerous potential growth trajectories for this species with little or no support for maximum estimated age (Figure 3). In most cases, measured growth in the first few years of life was used to estimate age for the largest fish by extrapolation (extension of the observed trend to larger fish); however, it is likely that this approach will underestimate maximum age as fish approach maximum length. Figure 3. Plot of all known von Bertalanffy growth functions (VBGF) for opakapaka throughout its geographic range (assortment of dashed lines from numerous studies and locations, see Andrews et al. 2012 for details). Metrics for growth characteristics were from studies based on otolith or fish growth observations (daily, lunar, or annual increments or zones, length frequency analysis, and tag-recapture observations). Age estimation procedures vary considerably and age of the largest fish was not validated. Note that maximum age (end of the dashed lines) ranges from approximately 5 to 30 years for similar sized fish. In addition, the range estimated for maximum fish length (L∞) covers unrealistic values; 551 mm FL may be too low (regional differences?) and 971 mm FL is too high for Hawaii, relative to the maximum observed length of approximately 800 mm FL. Determining valid estimates of age for the largest opakapaka in required a different approach because of the wide range of unknowns. Because the emphasis of this study was on the Hawaii populations of opakapaka, focus was directed at the potential variability within the Hawaiian Islands (Figure 4). Figure 4. Plot of opakapaka age and growth study results from the Hawaiian Islands. While there is less variation in the range of possible growth scenarios, the differences were considerable in terms of growth rate and maximum estimated age. The question remained, how old can the largest fish get? 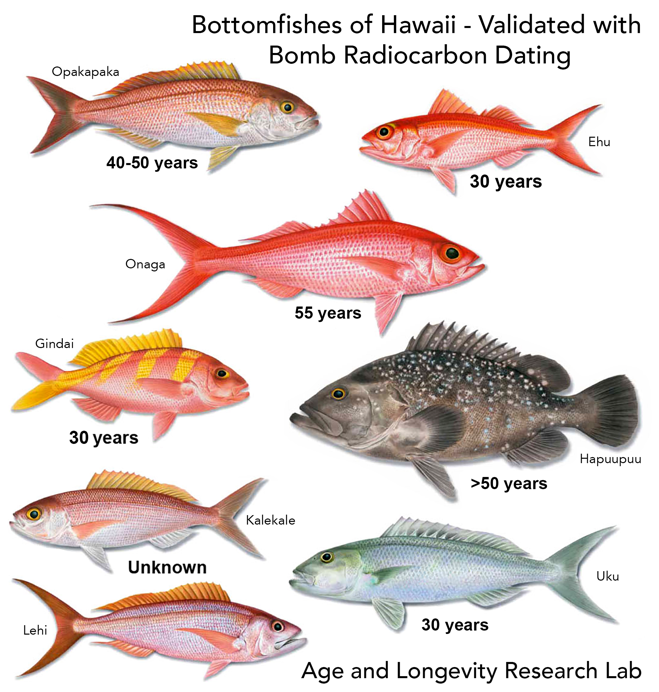 Recent advances in the use of radiochemical proxies for age have provided opportunities for age validation of numerous fishes throughout the world. The primary techniques in use are lead-radium and bomb radiocarbon (14C) dating. Unique to these methods is the ability to measure age with no observations of growth or otolith growth zone structure (i.e. age is determined in an independent manner). In this study, lead-radium and bomb radiocarbon dating was applied to some of the largest opakapaka. Lead–radium dating is a geochronological technique that uses the decay of radium–226 (226Ra) to lead–210 (210Pb) as a chronometer within the otolith, or natural clock for how long the fish has been alive (Smith et al. 1991). This kind of information can serve to validate other age estimation methods, such as growth zone counting (Andrews et al. 2009), or can be used to generate age estimates when no other age data were available. For the opakapaka, groups of the largest fish were aged in this manner and the results were surprising. Lead-radium dating of opakapaka resulted in unexpectedly greater ages than previous estimates. 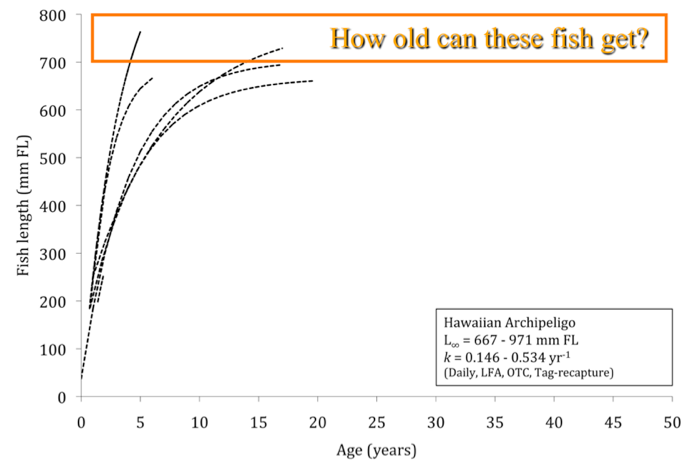 Maximum estimated age within the Hawaiian Islands was approximately 18 years, but validated estimates were made for fish up to a possible 16 years from a method limited to growth of younger fish. Radiometric ages exceeded 34 years with a high confidence that age can approach or exceed 40 years (Figure 5). Figure 5. Lead-radium disequilibrium (ingrowth curve) plot with measured values from opakapaka otoliths. Shown in this plot are 3 adult groups and 2 juvenile test groups. The juvenile test groups (grey circles) were otoliths stored for 11 and 22 years in envelops. Lead-radium ratios measured from the juvenile groups confirmed the storage time (time for measured lead-radium ratio matches curve) and provided evidence that otolith core material (first 2 years of growth) extracted from adult otoliths would reflect an accurate age estimate. The adult groups (grey squares) were fish of three different size classes (largest fish and two smaller-length groups). 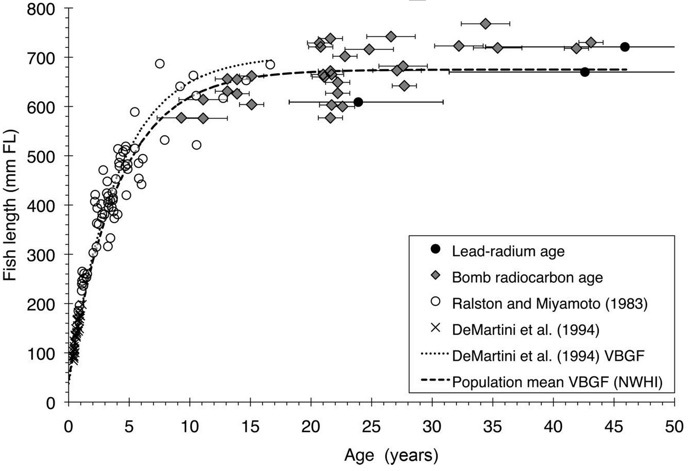 The measured lead-radium ratios were initially plotted at an age close to expected from a growth curve reflecting a maximum age of 18 years. The age estimates did not match the ingrowth curve and had to be shifted to older ages (arrowed projection of grey squares). Mean age was 24, 43 and 46 years for the adult groups. The findings of opakapaka lead-radium dating led to the conclusion that numerous fish in the existing population would exceed 30 or 40 years of age. It was therefore concluded that an application of a more precise age validation technique was possible, called bomb radiocarbon dating. The method could be applied to otoliths of opakapaka because birth years would be great enough for the requirements of its use. Bomb radiocarbon dating is a technique that uses a marker created by the rapid increase in radiocarbon from atmospheric testing of nuclear devices. The initial uptake of bomb–produced radiocarbon by the marine environment was virtually synchronous in the mixed layer of mid–latitude oceans. This time–specific signal provides a reference period that can be used to determine fish age and can either corroborate age estimates from growth zone counting in otoliths or provide age estimates where little or no other information was available. Bomb radiocarbon dating of opakapaka resulted in age estimates that were consistent with lead-radium dating. In addition, a series of smaller fish with collection dates ranging back to 1978 were aged with bomb radiocarbon dating (Figure 6). Collectively, opakapaka were aged using this method from 9 to 43 years of age. Figure 6. An example of age data made from a series of adult opakapaka by projecting the measured Δ14C value from the collection date (X symbol) to the validated birth year of each fish (diamond symbol) based on a fit to the reference series. 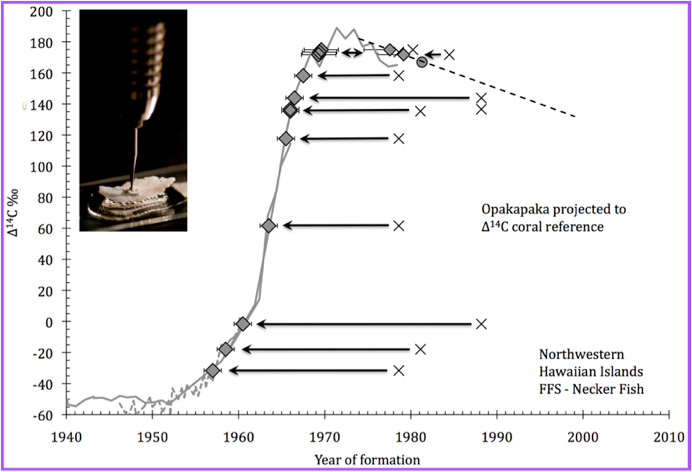 The bomb radiocarbon reference series is a collection of coral records from across the Hawaiian Archipelago with a juvenile opakapaka otolith (circle symbol) used to support an observed oceanographic decline of Δ14C for the region (see Andrews et al. 2012). Inset photograph is of an opakapaka otolith being sampled at its core by the micromilling machine. As a result of a long series of archived otoliths dating back to the late 1970s we were able to determine the age of fish from approximately 10 to 40 years. 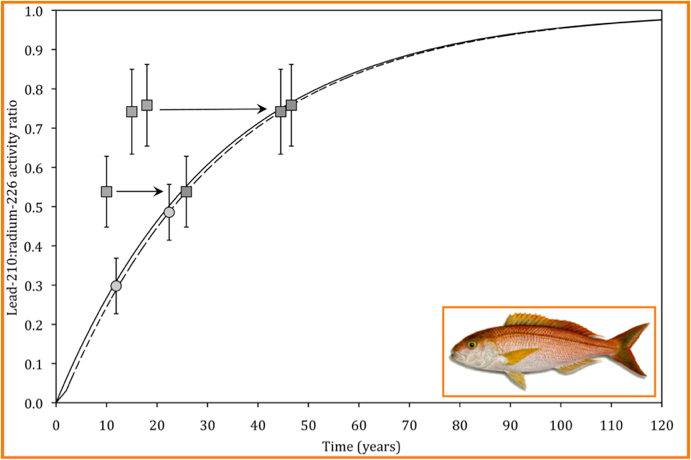 These data were combined with fish length and younger fish validated with other methods to make a complete growth curve for opakapaka (Figure 7). Figure 7. Revised von Bertalanffy growth curve plotted with all otolith-based age data considered reliable for P. filamentosus in the NWHI. 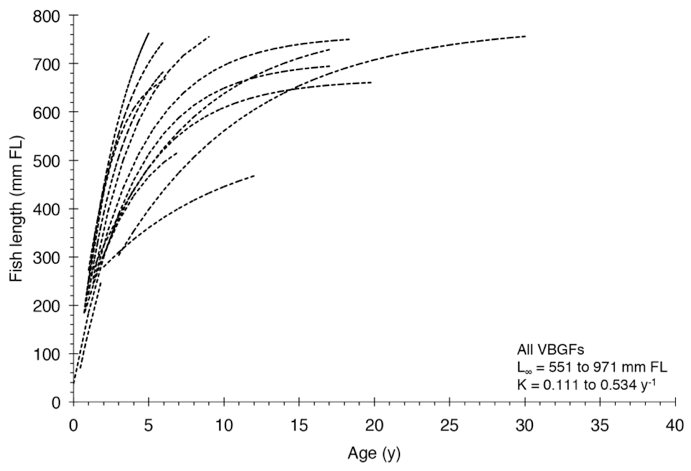 VBGF parameter estimates for the population mean were Linf = 675, K = 0.242, and t0 = –0.29. Plotted for comparison is the curve fit from DeMartini et al. (1994) that also used the age data from Ralston and Miyamoto (1983), with parameters similar to the comprehensive curve fit (Linf = 704, K = 0.25, t0 = 0.22). Note that breaks in the age-at-length bomb radiocarbon data (i.e., near the 15- to 20-year range) are an artifact of the collection year availability for P. filamentosus specimens relative to the informative or diagnostic rise in 14C period.